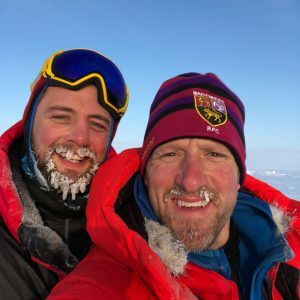 Immerse yourself in Team Borne’s Arctic journey by reading their expedition diary. 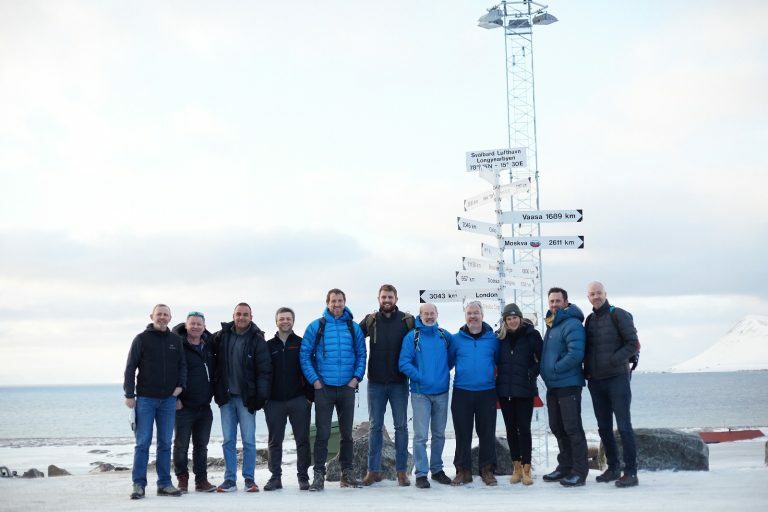 The team are at Russian ice station Barneo, 89 degrees from the North Pole, awaiting their lift back to the Svalbard. 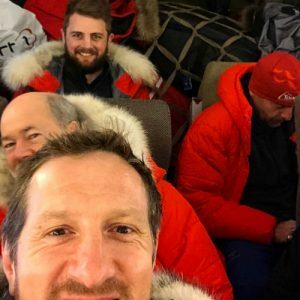 Will Greenwood and Jason Fox spoke to Naga Munchetty and Charlie Stayt on BBC Breakfast this morning. Video courtesy of BBC Breakfast. Photos by Jake Turney and Will Douglas. 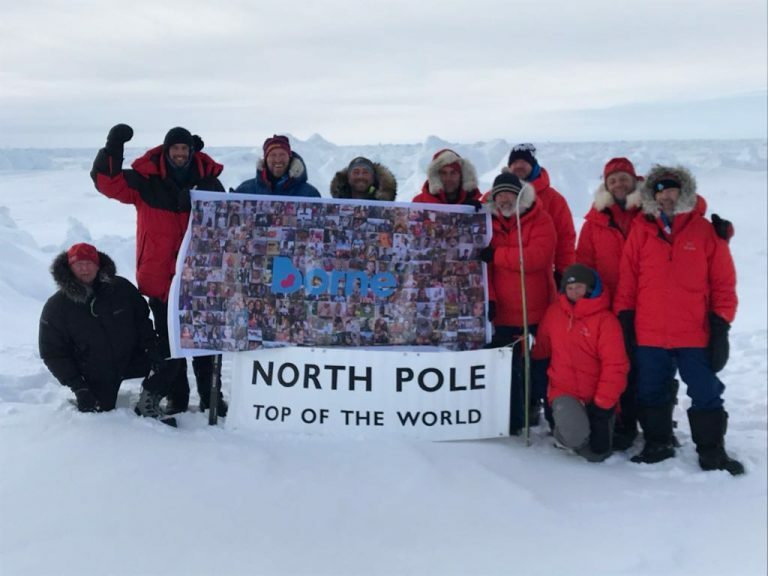 Thursday 19 April : We made it to the top of the world! 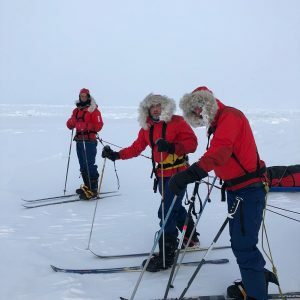 The team trekked with determination and arrived at the North Pole at 17:00 hours today. 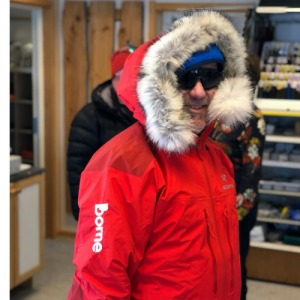 This final blog comes from Borne Chairman Julian Mylchreest. 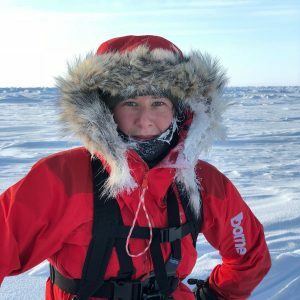 I am writing this in a heated mess tent at Barneo at midnight, so that tells you we made it – and if the tracker has been working, you knew that anyway! Still with temperatures on the trek ranging between minus 30 and minus 40, some of the kit has just been too cold to operate! Anyway, we woke up today blessed with great visibility and just 8 miles to go. Decision taken to go for it and not stop today till we made our goal. Serious rubble and ice rocks for much of the morning, then a good spell of open ice and snow – although the snow made the sled feel heavier – I was certainly starting to feel it…. From the second stop onwards, Alan put the slower folks (and that included me!) at the front to set a steady pace behind him that we could all cope with. Just 4 miles to go. One step in front of the other! A few falls, broken skis, rolled sleds and other dramas later, we were finally in touching distance. Beautiful big frozen leads on either side – one we crossed was about the width of the Thames in Putney and widening out ahead of us – but all good ice and for the final session not too much rubble. 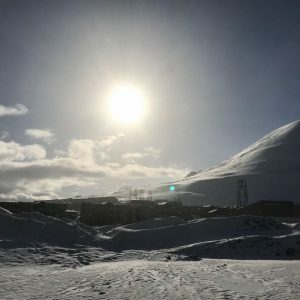 The sun was out in a big way now too – and by some freak of nature at the top of the world the curvature creates what looks like a second sun – amazing! The photos will be fantastic! Alan stopped us with 2 miles to go, and again with one mile to go. 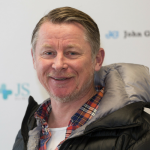 He urged everyone to give each other the time to reflect on where we were and why we were all there – every one coming with their own stories and motivations but everyone now very much one team and pushing on together for a special cause. 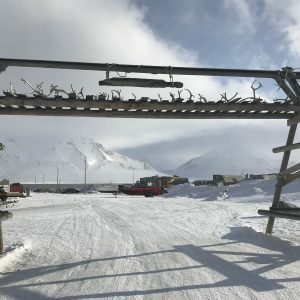 Mother Nature had today put the Pole in a good place for us – not on a ridge but on a flat stretch surrounded by rubble – and rubble that now looked beautiful as opposed to the challenge it had been the last few days. With 200 metres to go, we spread out next to each other in a line as opposed to the long single file we had been in every other hour. And then Alan counted us in to the Pole – the best ever final countdown! Amazing feeling!! Can’t put it into words I am afraid! 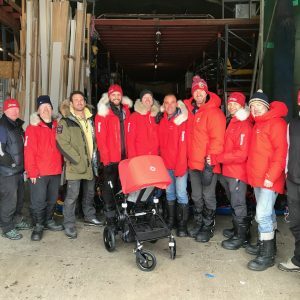 First thing though after the elation and emotion of nailing it was to put up a big ten-men tent and to put the fires on – suddenly everyone was very cold! Then, warmed up again, it was time for the photos and the flag. The corporate partners who helped get us there. 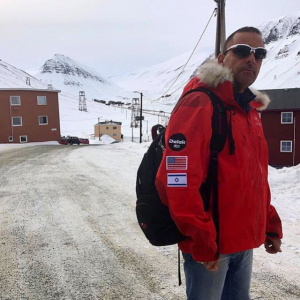 The flag of children born premature (each with their own story) that is hopefully also a flag of hope as we fund more research trough this trek. 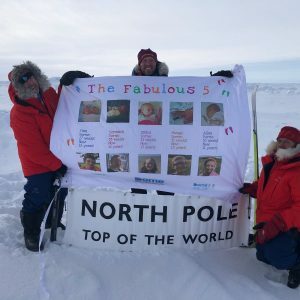 And then there were some personal moments for each of us – for me a flag Fiona made of our 5 children, all born premature, and a note from the children and Fiona that she had given to Alan to give to me at the Pole. An hour later the helicopter landed with a big whirr – the noise and swirling snow as it came in was great – our path back home! 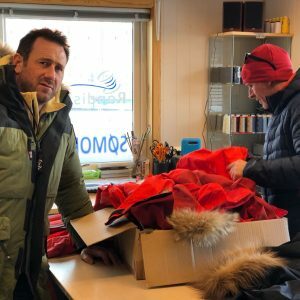 First stop though will be a night in Barneo base camp – but sleeping in a heated tent and eating real Russian food and drinking Russian beer – a perfect way to end an amazing, inspiring and awesome final day on the ice with the Borne dream team – one team, one goal, one cause – and today we just nailed it!! Team Borne carried the hopes and well wishes of over 200 supporters determined to end premature birth - a huge thank you to all of them! 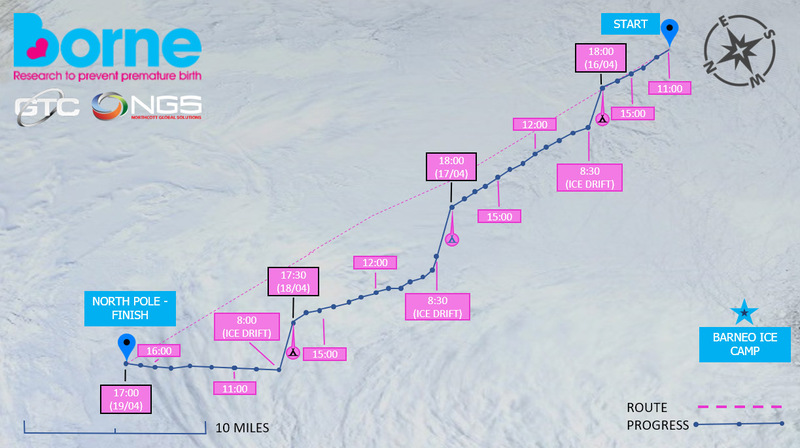 The ice drifted a further 3 miles overnight setting them 18.6 miles from the Pole at the start of the day. This evening’s blog is posted by the Arctic Fox himself. Another great day though fatigue is starting to take its toll on the team. The temperature has been a consistent -30ºC and there is no escape from the cold. Thankfully, there have been plenty of funny moments with Uzi in the lead as our Head of Morale. His humour is pure genius. We started the day with some low cloud and polar mist, but the sun burnt all of that away by midday and it’s been another clear day. Up to now, the winds have been light though I am writing this whilst sat in my tent, and it sounds like the wind is picking up outside. We got off to an easy start but soon encountered a large lead and Wayne had to go on ahead to scope out a suitable crossing point. Swimming was not on the agenda for this tour, and we needed to get everyone across safely. That was not the last of the excitement for the day. We encountered a large ice boulder field in our path which posed a real challenge. My skis gave up the ghost getting across, and I had to walk the last hour or so on foot! We are now bedded down in the relative warmth of our tents and I am about to dine out on what must be the furthest from Michelin-starred cuisine. We are all looking forward to the big push to the North Pole tomorrow! 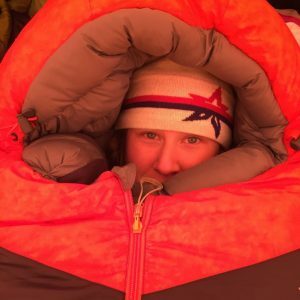 Stay warm all, and don’t leave your tent door open! This was a long day but we had the tents down by 10:00 and we set off through a chunk of rubble and then some clean ice where we made good progress. Then we had skis off to manhandle the sledges over some big chunks of ice before we had some clear running again. During the breaks, we sat across our sledges with soup or tea, then onwards again, working in 90 minute legs. The third and fourth legs of the day were the real challenge. First, a small lead that had broken through the pan of ice. We stopped for an early break while Alan and Wayne looked for a way through. The plan was cooked. We found a place where we could build a small ice bridge by putting chunks of ice in the river and then pulling the sledges across while the ice blocks held. 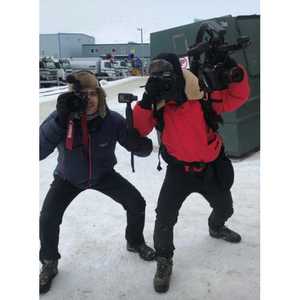 We thought we had the water cracked, but an hour later, came across another big break in the ice where we stood and watched the ice blocks moving before us… big crunching noises, water rumbling, ice blocks falling off the big wall that was being pushed up. But that big ice block was our way through! With sledges uncoupled, Alan and Wayne handled us and our sledges over this small ice block ‘hillock’ and across to safe solid ice. Into the home strait now. Final leg almost done but we had to keep pushing on as we hit another big rubble area. Skis still on, but tough narrow ledges and paths to navigate without falling over. I went over in a complete tangle at one point but Will, Dean and Neil helped me untangle and then manhandle the sledge again! End of the day. This called for a douple helping of fine Arctic cuisine : chili con carne and spaghetti carbonara. We were settling in for the night when we had a surprise visit from Joey to our tent with a bottle of Johnnie Walker. Life is… good. Only 8 more hours to the Pole. Maybe less if we drift in the right direction overnight. 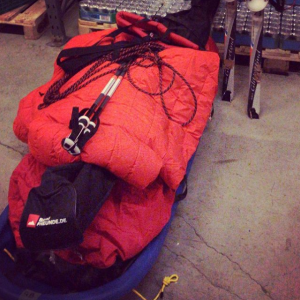 "During the breaks, we sat across our sledges with soup or tea." 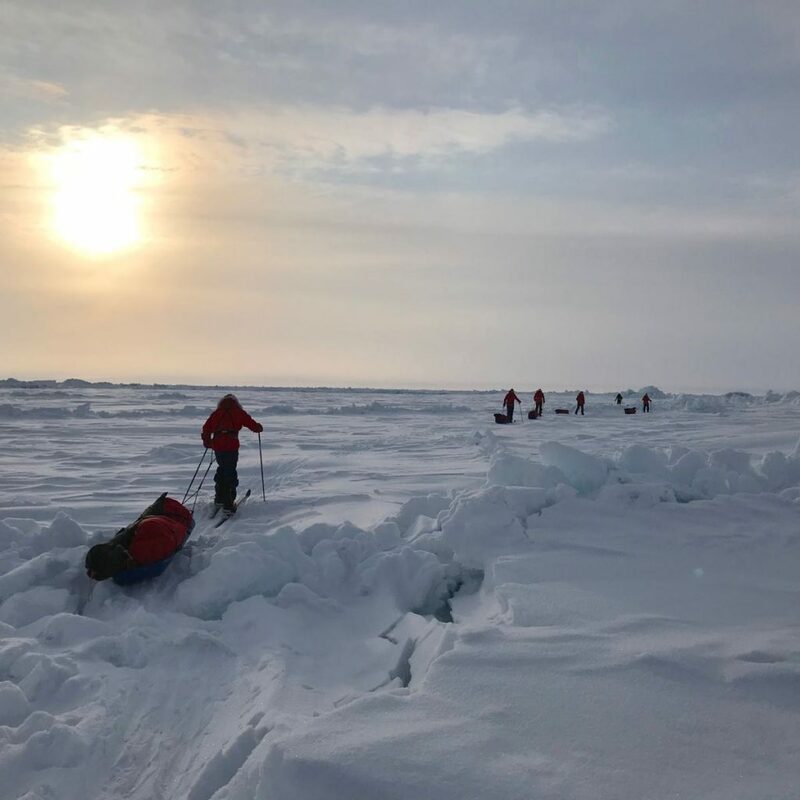 The ice drifted 2 miles overnight and the group covered 8.8 miles today. Spirits are high. This evening’s log entry is by Will Greenwood. “Stop. Listen. 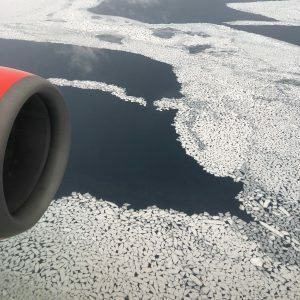 That’s billions of tonnes of ice moving.” ~ another of Alan’s amazing insights as a 15 year polar ice veteran. What an extraordinary day! We are somewhere between 89 and 90 degrees north. Most of us had our first in the snow … bizarrely enough, it felt like a badge of honour. How often do we get upset when it takes us more than 45 minutes to leave the house to set off to a restaurant or a family occasion. We will never complain again. Camp was busy from 06:30 and we did not leave fully packed and fed until 10:15. Wayne and Alan thought we were brilliant. We had 4 x 90 minute walks planned, with 20 minute breaks, and we allowed for the occasional 5 minute crevasse crossing. We had another first : ice boulders too big to cross with skis. Off came the boots. We had to drag our sleds by hand with our skis strapped to our sleds. Two sets of broken skis – mine and Jason’s. Fixed and changed on the go. There was no question that fatigue set in later in the afternoon. Bodies got cold quicker, rests were stretched a little, less food consumed. And then at 18:00, Wayne, our afternoon leader, dropped his harness and signalled that the day was done. No more walking but it was back to work… tents to put up, cold to beat, food to cook, legs to rest. Today began with bad visibility but good ice. 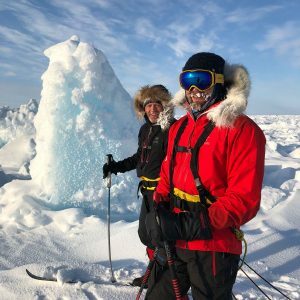 Then as the sky cleared, we saw an amazing cliff of sea ice — one of the 2-3 biggest Alan has seen in all his expeditions here! Maybe 20m high or more. So we diverted to get a closer look. 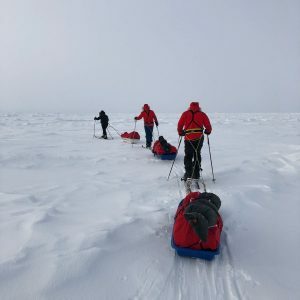 Next came a big challenge – some serious ice rubble that was impossible to get through with skis, so skis off and a massive team effort manhandling the sledges through. 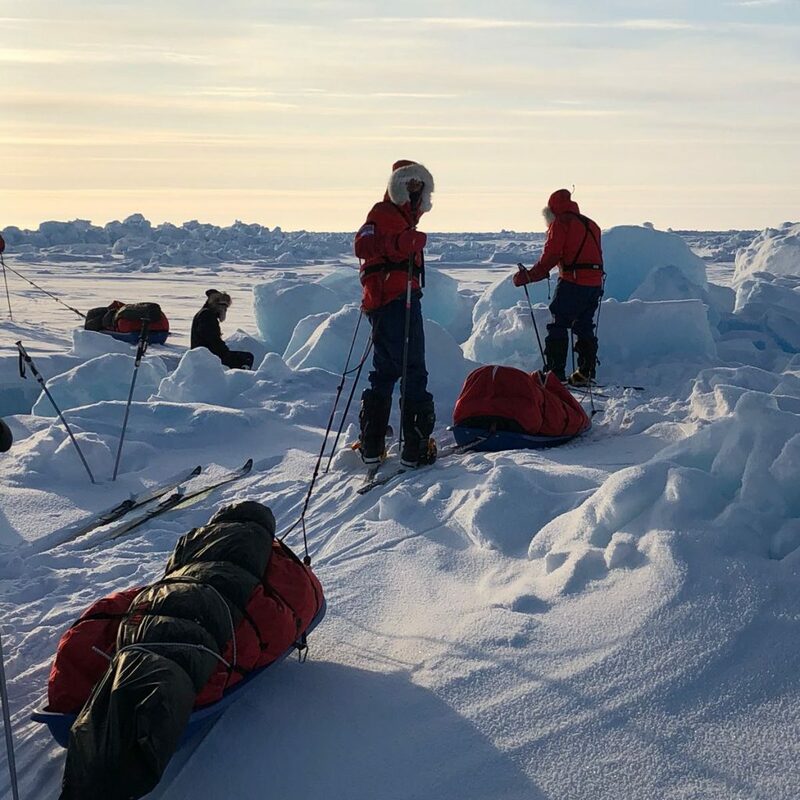 After that, we hit some seriously fragile ice – a big lead where the ice had opened up – so again, we went off track to work around it and make sure the team stayed dry. The workaround route was still tricky. Everyone split up with big spaces so as not to put too much weight on what was still thin ice. We felt a great sense of relief and satisfaction when we got through. And then the last obstacle before we pitched tents for the night: we came upon a small crevasse which we managed to bridge using our skis as planks. It was a challenging day, but a good one. 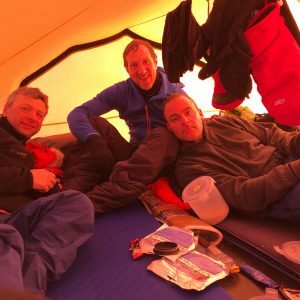 We played host to Dean and Neil in our tent for dinner this evening and are looking forward to a good sleep! The updates this evening are by Uzi Yemin and Borne Chairman Julian Mylchreest. 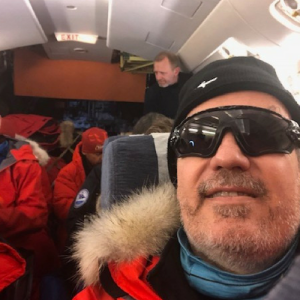 After a two and a half hour flight on an Antonov with two other expedition teams and a load of scientists, we landed on a runway of sea ice at Camp Barneo, that was set up only days earlier. 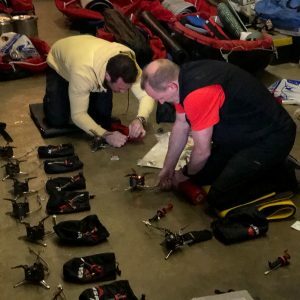 There, we attended a safety briefing, collected 40 litres of fuel for our stoves, then rode a Russian helicopter across the frozen Arctic to our launch point. It was a white desert below us. We landed, unloaded, hit the decks, covered our faces and sat on our sledges as the heli departed with snow flying everywhere. And then the quiet descended. We were all alone in a white expanse with nothing but what we have brought in our sledges. We stood together on the ice sheet staring at one another. Our faces froze immediately. We have to keep moving or freeze! 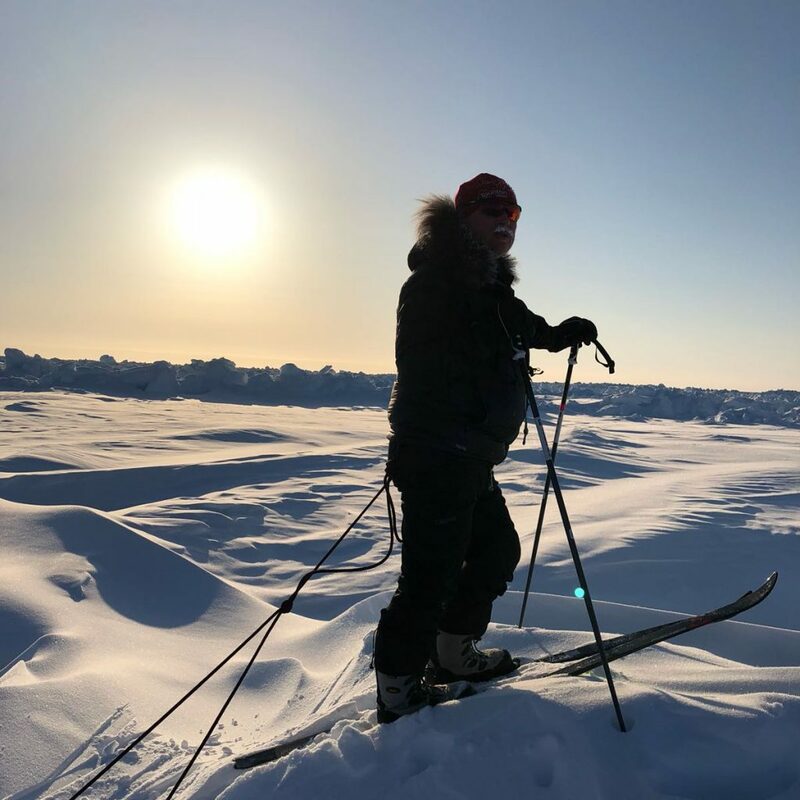 Alan led from the front, and the Borne Arctic team headed north in single file, pulling our sledges behind us. It was a good start. We had clear skies, a big pan of ice and some stunning ice formations around us (including one off to the right that looked like the cliffs of Dover)! We soon hit our stride, covering a lot of ground at pace. We had a short break with oxtail soup, pork scratchings and jelly babies, and soldiered on. Then, we came up against our first obstacle: some serious rubble. Multiple ridges extending as far as the eye could see with big blocks of ice that we had to clamber over and could not ski through. We decided to trek through the ice field before setting up camp, and not have to wake up to it in the morning. It involved a brutal bit of pulling and clambering. Some of us fell over, or saw our sledges turn over as we pulled and hauled them through the rubble. We emerged two hours later onto a new pan of ice, relieved to have passed our first polar test! High fives all round. Whoop whoop! 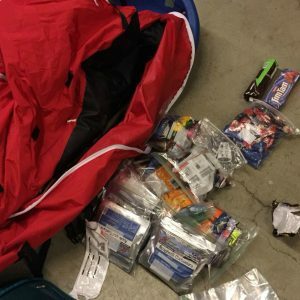 We found a good place to pitch our tents, and settled in for the night, dining out of our reheated food bags before curling up in our sleeping bags for a well-earned night’s sleep. What was on the menu tonight? Oriental chicken and cinnamon rice pudding flavoured by melted Arctic snow. Yum. 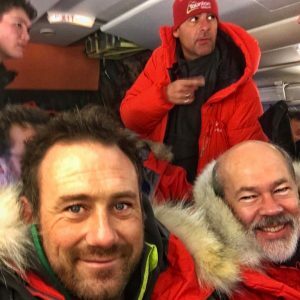 The adventure has begun… and as we drift off into restful slumber, we wonder how far the ice we are sleeping on will drift overnight, in our favour or against? Can the stunning view make up for the unrelenting pace? Are these... the white cliffs of Dover? 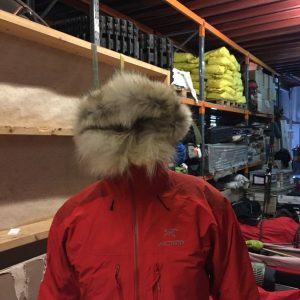 Zero exposure: THIS is the way to stay warm! 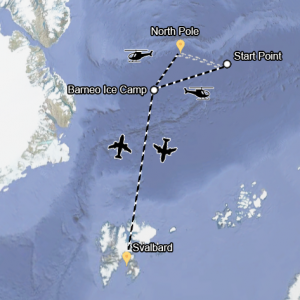 The team flew out of Longyearbyen early this morning, a day ahead of schedule, to make their way to Barneo Ice Camp. 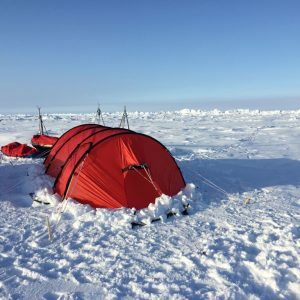 Based approximately 60 miles from the North Pole, the Camp is set up for one month of the year in April. From there, the team will be airlifted by helicopter and dropped off at the start point. 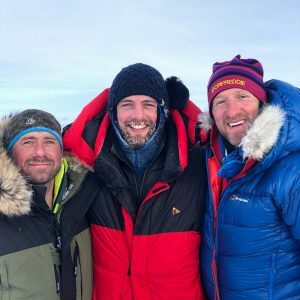 They will set off from there, walking in temperatures averaging – 25 °C, and fighting off icy winds, before setting up camp in the frozen Arctic for the first time. Imagine dragging that 8 hours a day? 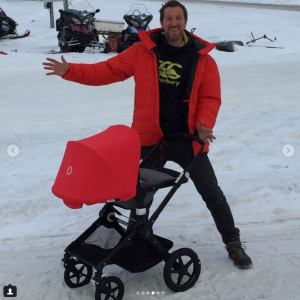 Will says yes Bugaboo Fox! 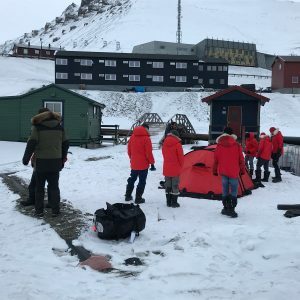 A very busy day today getting ready for the expedition. Packing. Repacking. 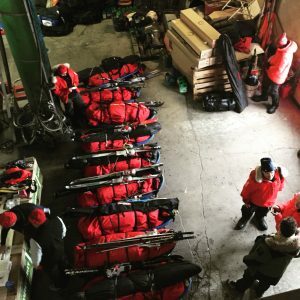 Ski, tent and sledge packing demonstrations. The rule is “if you pack it, you drag it” so a few selective choices today about what goes and what stays. The polar bear trip wire is definitely going. The meals are in packets. Just add melted snow. 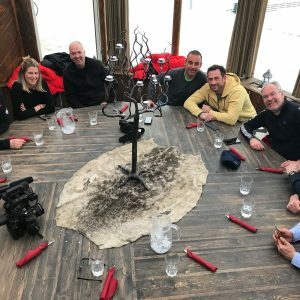 The team are going to enjoy their dinner this evening. Last night, minke whale and reindeer stew were on the menu. Sledges were loaded onto the aeroplane at 8 pm ready for a 9 am departure in the morning. Their watches are set on Central European Time. Rest up guys. The adventure begins tomorrow! "If you pack it, you drag it!" 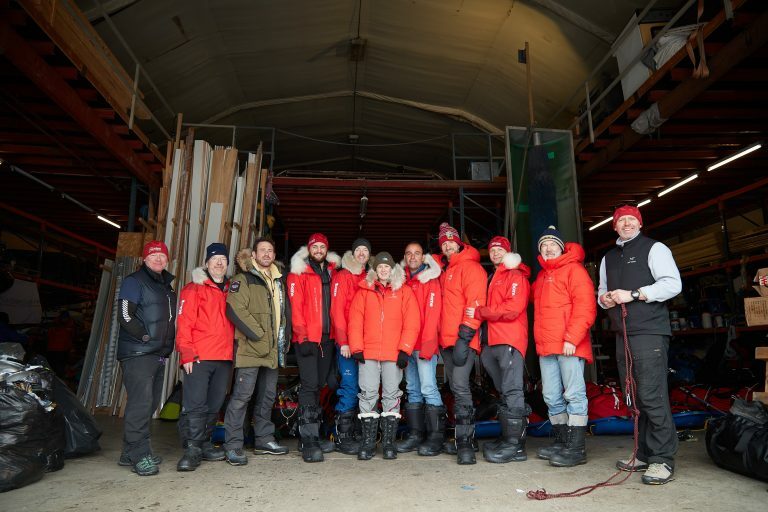 The expedition team arrived in the Svalbard late today. 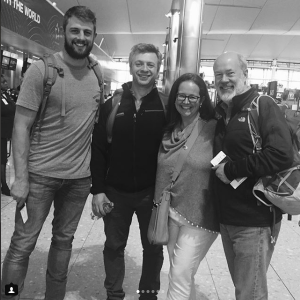 Many met for the first time at the airport, and will get to know one another over dinner. 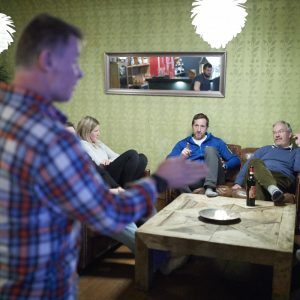 They will be up early tomorrow, ready for a full day’s training in the Norwegian wilderness. 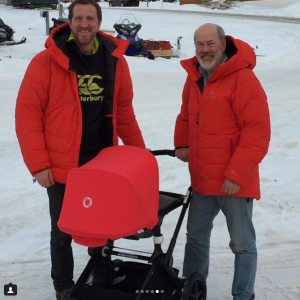 For some, it will be the first time they are going to be walking on skis, pulling a 40-60kg sledge! 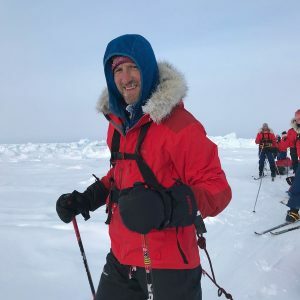 Expedition leader Alan Chambers reports. 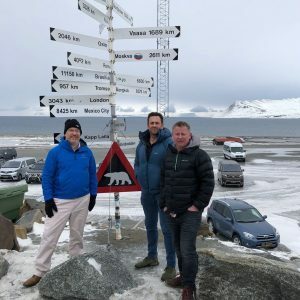 Expedition leader and polar explorer Alan Chambers has set off for Longyearbyen in the Svalbard with former Special Forces solder and TV star Jason Fox and Borne Chairman Julian Mylchreest to get a head start on preparations before the main contingent arrives. 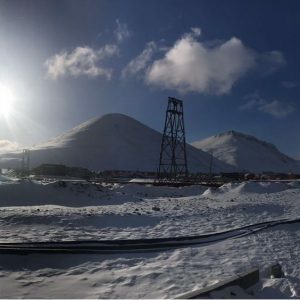 Longyearbyen is a small town on the Norwegian Archipelago of Svalbard. They are well above the Arctic Circle there, at 78 degrees north. 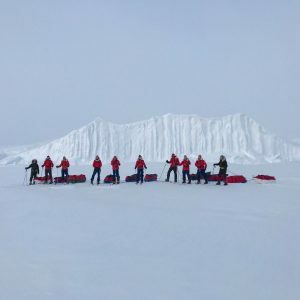 The team will convene here over the weekend, complete their trek preparations and practice session with the sledges and camping equipment on the glacier before being airlifted to the Arctic Ocean. "All is going really well, weather's looking good and Barneo's all been set up. Everything on schedule for a great, great journey." Our chairman Julian is ready!